When it comes to promoting healthy, safe work, we’re science-led experts and we’re mentors. Our team is based in the Center for Health, Work & Environment at the Colorado School of Public Health. As a nonprofit program within a university, we use evidence-based strategies to help you improve workplace health and safety. Meet the team behind Health Links™. We’re a group of dedicated, passionate leaders in health and safety and we’re here to help you be the health and safety champion your team deserves. How do we assist organizations around the country in improving the health and safety of their workplaces? 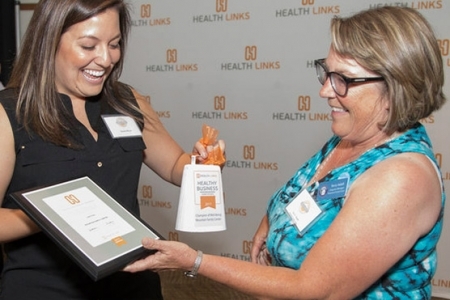 Every year, Health Links™ presents awards to organizations and individuals who are leading the way in workplace health and safety in Colorado. Applications for these awards are now open. Eligible employers in Weld County may apply for awards of up to $1,000 to fund sustainable health and safety improvements to their workplaces. Health Links™ is made possible by support from our partners. Interested in getting involved? We’re always on the lookout for dynamic partnerships. As a partner, you’ll work with Health Links and our parent organization, the Center for Health, Work & Environment at the Colorado School of Public Health.